The City of Southampton has been invaded by Rhinos! Well actually they are not real ones, but 3D fibre glass ones painted by local artists and schools. Marwell Zoo is behind the initiative 'Go! Rhinos' to help with the protection of wildlife. Each Rhino has been sponsored by a company or organisation. After their public display on the streets of Southampton, the Rhinos are due to be auctioned off and the proceeds put toward wildlife protection, plus two local charities. The Rhinos are on display around the City from July 13 to 22 September 2013. 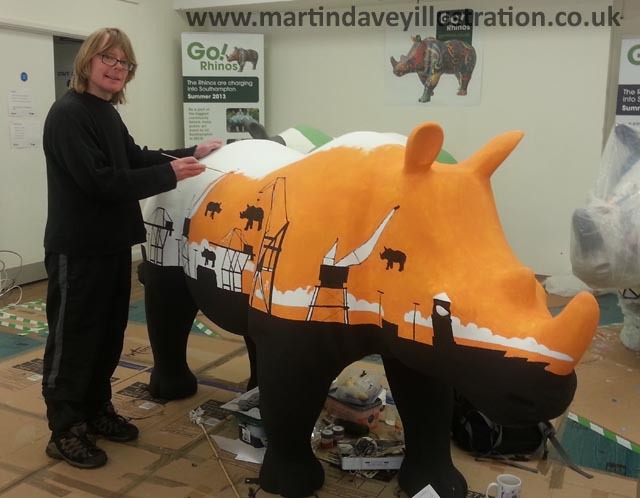 There are 36 large rhinos, painted by local artists to see on the 'GoRhino' trail, plus around 80 smaller ones painted by local schools, which can be found in many shops and public buildings in the City. 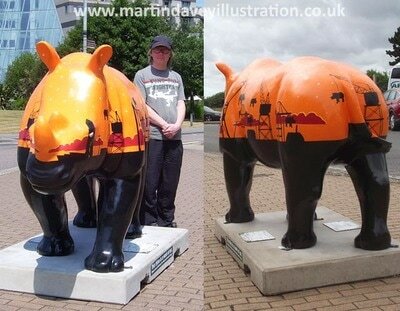 The Rhinos are all beautifully painted and look great on the streets. I'm pleased to say that the public, especially, children, seem to be enjoying them. I often see children cuddling them or having their picture taken by, or under them! I was commissioned to paint a Rhino and I took the theme of the Southampton skyline, which in one direction is dominated by the large cranes working at the Docks. There are several types of cranes. Some are used for general cargo, some with containers and one distinctive design is a floating crane. 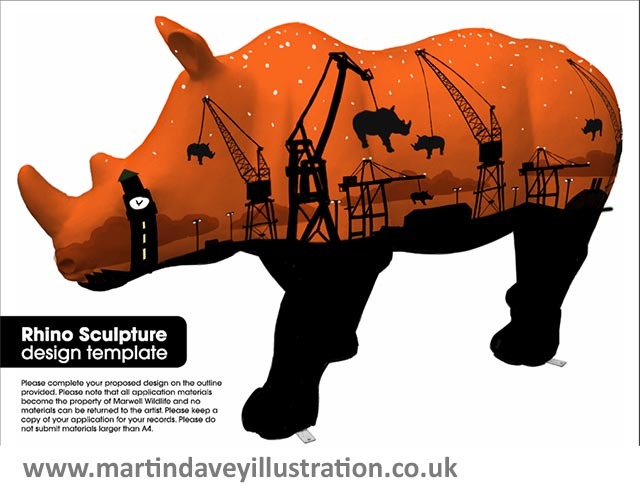 I thought that this would make an interesting design theme for a Rhino as it incorporates something that everyone in the city has seen in reality but not pictured as an artwork. It was decided to make the skyline be seen as a silhouette against an evening sky. This would make it easier to paint and give the design more 'punch'. Some famous buildings were added in to the skyline, such as the SeaCity museum, and the clock tower of the Civic Centre, in which the actual clock became the Rhinos eye. The sky was kept as one shade of orange to keep things simple. Stars were added as were clouds to add interest. The dark red clouds had highlights on them to help 'crispen' up the design and add contrast to the silhouette cranes and other details. It took just over a week to do and I was quite worried about doing something as large as this. I usually paint at quite smalls scales on canvas. Painting one of these Rhinos is more like a DIY job! I used household paint and masking tape to try to get straight lines. Because of the technical nature of the cranes, I needed to paint them reasonably accurately, particularly as it was to be sponsored by DP World, and Associated British Ports, the owners of the dock cranes. I initially started with drawing a grid over my design in photoshop. 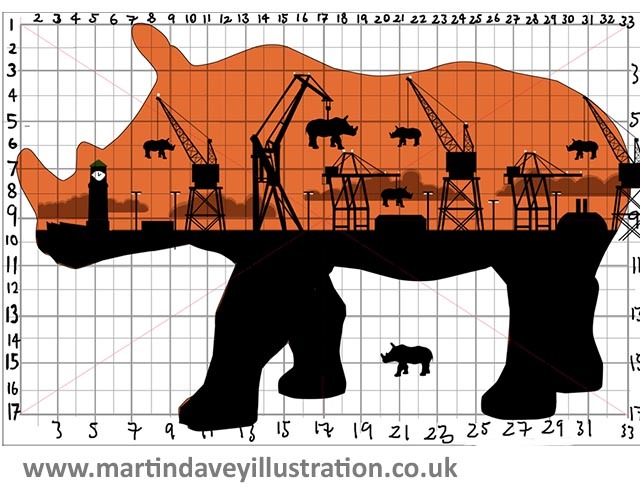 This grid was them carefully mapped out on to the rhino, so that I did not have to do much guesswork and freehand drawing on the Rhino of these complicated shapes. Each colour had several coats of paint, and after completion several coats of varnish were applied. The paint was matt, but once the varnish was applied the colours sprang in to life and made the design look dynamic!